Slip and fall injuries on icy driveways and sidewalks are serious business. A simple fall on a slick sidewalk can have far reaching effects, physically and financially. In an effort to protect citizens and minimize liability, state and local governments are passing snow removal laws “encouraging” homeowners to clear their walks. In most cases, if your sidewalks aren’t cleared within 24 hours after a snowstorm, you may be open to fines and vulnerable to lawsuits. Removing snow from driveways and walkways is not an option. In most states, it’s the law. If the coming winter is anything like the Polar Vortex of 2014, snow removal will be a challenge. During some of the heaviest snowstorms last year, homeowners shoveled as many as three times in one day. Snow removal services were inundated, and in some cases unable to reach their clients’ locations. Sidewalks that were cleared iced over, creating hazardous conditions for pedestrians. To solve this problem, many homeowners bought salt and other snow melting chemicals. While this shovel-and-salt method can be effective, it’s time consuming and expensive. Fully automated – Warmzone radiant snow melting systems are programmed to detect weather conditions, so they activate as the first snowflake hits the ground to keep your driveways and walkways safe and clear. Maintenance free and easy to operate – Because electric heated driveways have no moving parts, they are maintenance free. In addition to being fully automated, the systems also feature a simple manual override capability to deal with snowdrifts or shaded areas that iced over. Environmentally friendly – If you’re keen on all things green, radiant heat is definitely the way to go. Snow melting chemicals can damage surrounding landscapes, and the residue left behind often ends up in local water supplies. Efficient and effective – At your shoveling best, you can’t outpace a Warmzone heated driveway. Before most of us can slide on a pair of boots, a radiant heat system is operating to keep the entire driveway snow and ice free. How much will it cost you? Not much, especially when you consider eliminating the possibility of lawsuits and fines. Because Warmzone carries a large selection of snow melting systems and products, they can also put their expertise to work for you to come up with a custom solution that’s affordable and effective. The other good news is that Warmzone provides free installation support to help ensure that your system is installed correctly and performing as expected. You also have access to Warmzone’s extensive online library of radiant heat documentation. 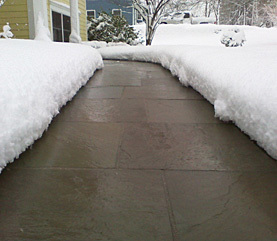 Call Warmzone at 888.488.9276 to learn about the many snow melting options. Installing a radiant roof gutter trace system can save you in the long run. Because your radiant heat system is only as good as its components and installation, using the right roof deicing heat cable for your gutter trace system is crucial. Warmzone is dedicated to offering the most advanced snow melting technologies and components on the market, and the latest iteration of self-regulating heat cable is a great example. The fact is, Warmzone’s industry leading self-regulating heat cable for gutter melt and downspout heating just got even better. The idea to take an already great radiant heat product and improve upon it for gutter and downspout installations came from installers in the field. Installing roof heating cable requires a heat cable that’s durable, lightweight and easy to work with. The footprint of every roof is different, often involving tight corners and hard to reach places that make laying cable tough. During an installation, cable durability, weight and flexibility all come into play to optimize performance at the roofline. The better the fit, the more secure the cable is for a confident performance. It bends nicely for times when you need to change directions, facilitating quick and proper installation. The enhanced gutter melt cable is designed for long lasting durability and flexibility and is available in 3, 5, 8, and 10-watts per foot versions at 120 or 200-277 volts. The self-regulating cable is also rated for hazardous locations and features a 10-year manufacturer warranty. New activation devices such as the WZ-2C also enhance fully automated performance. So whether you’re new to home improvement or a diehard do-it-yourselfer, you can be sure you are installing a trusted, long lasting and proven roof deicing solution. Warmzone’s enhanced self-regulating heat cable construction raises the bar for roof gutter and downspout heating. RoofHeat cable features an irradiated, conductive core that increases the heat output as outside temperatures fall, and decreases output as temperatures rise to efficiently, effectively melt snow and ice. This core is protected by a rugged outer construction designed to ensure the cable is functioning safely apart from the sting of a cold winter’s day. This unique construction also makes it durable, safe and extremely energy efficient. The design changes have taken the top performing heat cable and given it even greater effectiveness and efficiency. When paired up with a Warmzone automation device, the new RoofHeat cable comes through with even faster automated response times to stop precipitation events that lead to unwanted ice damming and roof damage. In cold weather climates, RoofHeat heat cable is a must for your radiant gutter melt system. 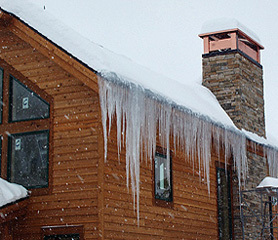 It can stand up to extreme weather conditions to protect your home by keeping your gutters and downspouts free of snow and ice. The cable can also be used to heat other trouble spots on your roof. To find how you can take advantage of RoofHeat’s extreme snow melting abilities, contact Warmzone at 888.488.9276.